1) The Duke Spirit. If I was given the option of turning my friends and readers on to just one new artist it would be The Duke Spirit. Handing out four free tracks prior to their new CD being released is just the start of how cool this band is. They’re kind of like Velvet Underground meets Mazzy Star, but spunky. The first single from December’s Kusama EP (and the full length Bruiser due in early 2011) “Everybody’s Under Your Spell” isn’t just the best thing I’ve heard yet from The Duke Spirit, it’s probably the best song I’ve heard all year. Download it from their website and have a listen for yourself. 2) Planet Sheen. Possibly the most entertaining new animated program this season. Nickelodeon has churned out another hit. Estevez Sheen, from Jimmy Neutron: Boy Genius, gets into one of Jimmy’s rockets, presses the “do not press this button” button, and is subsequently marooned on Zeenu, a planet 4 million and 1 light years from Earth. Hilarity ensues. 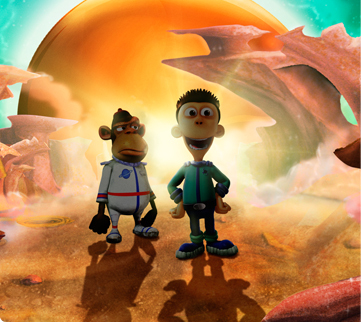 Planet Sheen is chock full of fun and quick witted craziness. Oh yeah, and a blue warrior girl and fire waffles and a monkey and all kinds of weird aliens and a giant tortilla monster and, well… you get the idea. 3) The End of the World being cancelled, or at least postponed, because somebody couldn’t add. I have been very interested in the history of Mayan civilization for some time, even more so after seeing the Time/Life documentary “Maya: The Blood of Kings” about 15 years ago. It had this super dramatic scene with a big spinning stone wheel calendar foretelling the end of days in late December 2012 and I was like “Oh, really? Well, everybody is getting their Christmas presents early that year.” Now that year is about to become next year. The good news it seems, oddly enough, is that somebody should have payed better attention in math class. The GMT Constant calculation used to determine the date, (previously expected to correspond with the 2012 Winter Solstice) is flawed and may be off by as much as a century according to “Calendars and Years II: Astronomy and Time in the Ancient and Medieval World” (Oxbow Books). So yay for us! 4) My Family and Friends. 2010 has been a banner year for making great new friends and I love my family, so yeah I’m thankful alright. Very thankful. Could someone pass the cranberry sauce please?